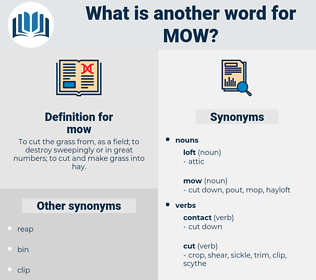 What is another word for mow? 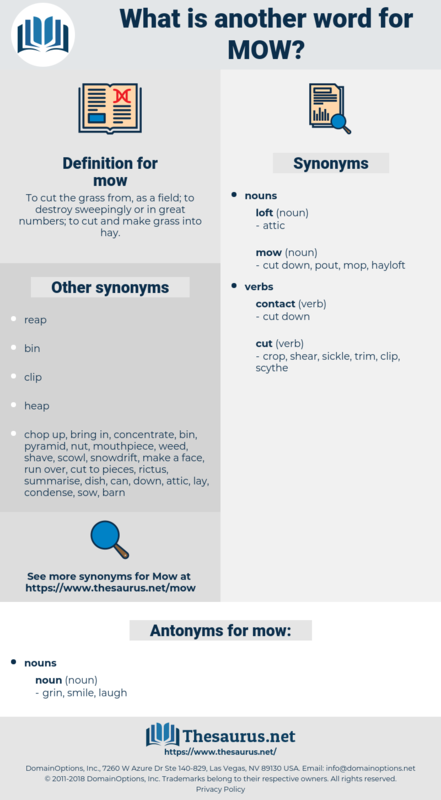 To cut the grass from, as a field; to destroy sweepingly or in great numbers; to cut and make grass into hay. They had about made up their minds to carry John to the barn and stow him away in the hay mow but it had turned uncomfortably cool and this plan was abandoned. These generous sentiments naturally led her to consult the interest of her neighbours; and as most of their lands were meadow, and they depended much on their hay, which had been for many years greatly damaged by the wet weather, she contrived an instrument to direct them when to mow their grass with safety, and prevent their hay being spoiled. moan, moo, mania, main, min, mammea, maia, Moho, mayhem, mynah, moa, maha, mam, money, mahoe, mei, 8 May 1945, mamma, mamo, mummy, mona, menomini, Moonie, mine, muumuu, mo, momma, may 24, meany, mnium, m3, me, mammy, minoan, mn, mommy, maoi, mimeo, minah, minim, mon, maine, menominee, mane, ma, mom, mew, monomania, men, mama, mayo, mime, mem, Minyan, many an, menu, minimum, maim, mum, mini, moneyman, meanie, meme, manama, minnow, m1, manna, maw, mown, memo, meaux, many, maya, moon, miami, mooneye, may, mi, mayhaw, miaou, moue, mien, mm, mann, manannan, mina, may 1, monoamine, man, mahonia, minium, MAU, mamey, moony, mayenne, M, moynihan, mahayana, Moe, mym, miaow, meow, M.M., mho, may wine, myoma, mono, ma'am, mean, mao, maui, mannheim, mya, mammee, muon, mahimahi, miao, many a, moon on, mayan, myna, m2, minion, mahan, mu, m-1, mammon, menuhin.